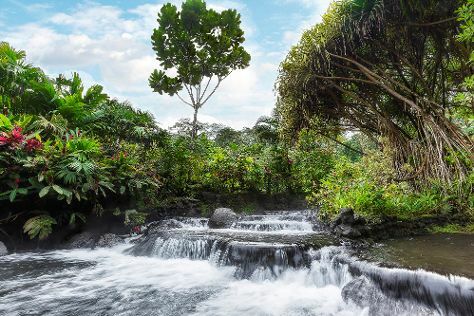 Set against the backdrop of the imposing Arenal Volcano, La Fortuna de San Carlos offers visitors a chance to explore diverse natural landscapes and sample some delicious local produce. Named for the bounteous harvest provided by the area's rich volcanic soil--and perhaps for the fact that the town has never been destroyed by the volcano--La Fortuna enjoys a warm but not overly hot climate, with temperatures ranging between 20 C (68 F) and 26 C (78 F). Things to do in La Fortuna de San Carlos include whitewater rafting, kayaking, mountain biking, and visiting the area's famed volcanic hot springs. La Fortuna de San Carlos is in Arenal Volcano National Park. Make your own La Fortuna de San Carlos vacation itinerary, with a little help from those that know the place like the back of their hands, by using our Costa Rica day trip app .